As Orgo 2 lectures start up, there will be a number of concepts that will be covered quickly to speed up the class so you can learn lots of functional group transformations this semester. In this article, we will discuss the concepts and theories of Thermodynamics. While the topic sounds complicated, we at StudyOrgo have extensive experience instructing principles and reaction mechanisms frequently covered in Organic Chemistry. Sign up today for clear, detailed explanations of over 180 Orgo Chem reactions and reviews on conceptual topics! Aromatic compounds contain conjugated systems of pi bonds, meaning one pi bond after another, that are arranged in a ring. This creates a current of electron density that circles the compound. If the pi electrons fill the bonding molecular orbitals, the compound becomes aromatic! But if too many pi electrons are present, the non-bonding and antibonding orbitals become occupied, and the compound is now anti-aromatic. Aromatic compounds are UNUSUALLY STABLE and have important chemical and synthetic uses. How do we know if the compound is aromatic or not? Here is a short list of rules lists the properties of aromatic compounds. However, anti-aromatic compounds have an unusual INSTABILITY to them. Many times students are asked to describe the molecular orbitals of aromatic compound examples. How do we know what they look like? An easy way to describe the molecular orbitals of small conjugated rings is to draw a Frost Circle. To do this, follow the steps below. Draw a dotted line through the middle of the circle – this is the boundary between bonding and antibonding orbitals. Any pi electrons on the line or above the line are in non-bonding & anti-bonding orbital and are UNSTABLE. Below are the Frost Circles for many types of rings. Before you begin, make sure the Huckel rules apply; do you have enough electrons? Is it SP2 hybridized? Is it a ring? Is it planar? Some aromatic rings are heterocyclic (elements other than carbon) and ionic (meaning one of the elements in the ring has a charge). If you have the Huckel rules applied, then determine the number of pi electrons and fill in the Frost Circle. Three double bonds = 6 pi electrons. Paired together, all of the pi electrons are in bonding orbitals so benzene is in fact aromatic. Four double bonds = 8 pi elecrons, Pairing the first 6 electrons in the bonding orbitals, we place last 2 electrons in each of the non-bonding orbitals. Because of these two electrons, this molecule is anti-aromatic! Practice, practice, practice! This is our suggestion to learn these tricks. As you advance to aromatic reactions, it will be much easier to find shortcuts to faster synthesis schemes and solve more complicated examples which will surely be on your final exam. 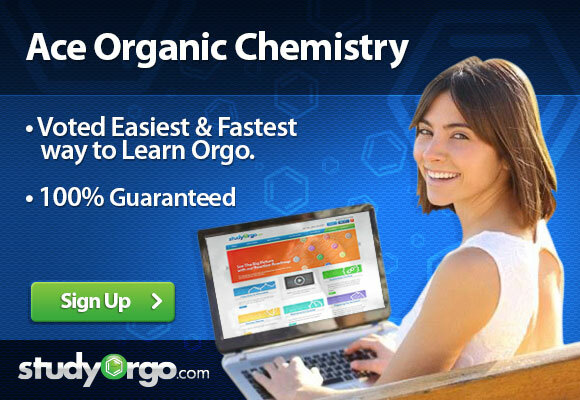 Sign up with StudyOrgo.com today to master over 180 organic chemistry reactions and learn the mechanisms fast!